As a child I remember having a book (or books?) with Aesop's Fables in it. The crow who filled up the jar of water with pebbles so as to reach the water, the hen that laid the golden egg and the frog who insisted he could be as large as a pull and huffed and puffed himself up until he popped. I knew they were stories with meaning even then. However, I had never read the full collection until this past week. I didn't realize how many of the fables contained phrases that we hear all the time (i.e., "Look before you leap!"). It was interesting to read them now with more understanding. I enjoyed the fables for the moral points they had to make. If you allow them to impact you, they will. I think it teaches points in a manner that young children, in particular, can relate to and understand. However, they do not leave adults behind in the dust. A lion often prowled about a pasture where three bulls grazed together. He had tried without success to lure one or the other of them to the edge of the pasture. he had even attempted a direct attack, only to see them form a ring so that from whatever direction he approached he was mat by the horns of one of them. Then a plan began to form in the lion's mind. Secretly he started spreading evil and slanderous reports of one bull against the other. The three bulls, distrustingly, began to avoid one another, and each withdrew to a different part of the pasture to graze. Of course, this was exactly what the lion wanted. One by one he fell upon the bulls, and so made easy pray of them all. Moral: United we stand; divided we fall. I didn't know, going into the book, who Aesop was. For some reason I had in mind that he was a fable teller sometime around the beginning of the last century. (ha ha) Turns out he was a slave in the mid-6th century in Greece. (oh!) Apparently it is argued that he was of African origin which I find easy to believe given the nature of the tales. I understand African literature and stories to contain many fables and lores which are passed down from generation to generation. These particular fables relate animals behaving frequently as they would on African plains (i.e., in fables that involved animals hunting, etc.). I have always imagined Aesop as a wise old sage - you know, the type that lives on top of a mountain somewhere - who instructs the little children on how to live. Apparently his peers and betters did not find him to be quite so wise and he met a violent death at the hands of some of his opponents. For some reason I'm set to thinking on Proverbs and true wisdom. True wisdom comes from God and not from man. From the history given online of Aesop, he seemed to think himself very wise in his own eyes -- which pretty much set him up for a downfall! Now, do I think he had some wisdom to share? Of course! Every man and woman does. Aesop's Fables are valuable, I would think, in causing children to think about their actions and the effects that such actions, and/or their words, would affect those around them. I enjoyed the Fables and appreciate knowing more about Aesop as a result. I don't think they should be mistaken or substituted for gospel truth in every occasion, but they can be a valuable tool nonetheless. 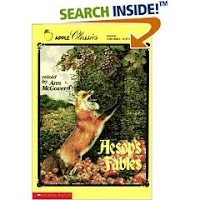 Many people have translated and adapted Aesop's Fables, from Socrates to Leo Tolstoy. If you are looking to pick up a copy for yourself or your family, Amazon.com has a wide variety to choose from. I found a children's illustrated version at a local home school book sale and I look forward to providing my children with happy memories of these Fables. This is really interesting. Thanks for this reminder. It might be a good tool to use with Amanda, discussing a fable and moral each day. Can anyone recommend a nicely illustrated version of the Fables? I would like to add a copy to my library.